Never go on holidays without a plan! That’s how I approach all my trips, and it generally proves to have positive outcomes. I don’t know about you, but I can’t just get on a plane, land somewhere, and then start exploring. I have to at least know a little about what I’m going to do when I get there, what I’m going to see, how I’m going to get around, etc. With that in mind, I’ve come up with a few tips for you to consider, before you visit Dublin city. Where you end up staying could really make or break your vacation. If you’re planning on spending most of your time visiting city center attractions, you don’t want to find yourself in a hotel way out in Lucan. Keep in mind that Dublin city center is quite small, so if you end up staying smack dab in the middle somewhere, you’ll be able to walk to most things you want to see. For me personally, I prefer this approach. I love walking around, exploring on foot, and taking my time enjoying the sights and sounds of the city. Dublin has no shortage of accommodation options whether it’s hotels, B&B’s or hostels that you’re looking for. You can get an idea of the accommodation options that await you in Dublin by stopping by trivago. Spend plenty of time at home planning this one. As small as it is, Dublin is packed with things to do and see. 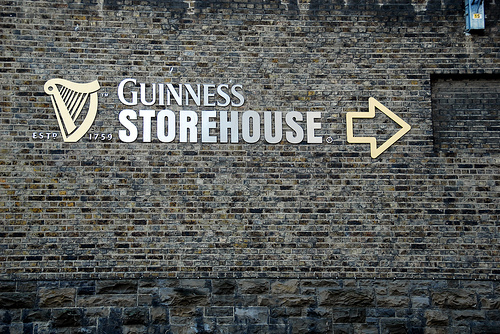 (try VisitDublin.com) But…you can’t see everything, not in one trip anyway, nor will you want to. When I’m heading off somewhere I always read personal reviews of the attractions I want to visit. I find it helps me weed out the ones I can save for next time, and helps me figure out which ones are best. If you’re planning on visiting a few of the fee-charging attractions, e.g. Dublin Zoo, The Guinness Storehouse, The Jeanie Johnston, various museums etc, you might want to look into getting the Dublin Pass. As wonderful as the map capabilities on smartphones are, having a printed Dublin city center attraction map can be very useful. It gives you a good view of everything in perspective to what else is nearby, and it saves you from relying on glitchy mobile networks or coffee shop WIFI. Most hotels will have city maps available in their lobby, so grab one when you check in, or when you’re headed out for the day. You can’t visit Dublin, or Ireland for that matter, and not sample a few of the local city pubs. We could debate all day and night which ones are the best, or which pour the best pint (you’ll find Irish people are very opinionated about this). You’re preference might be a lively hotspot in Temple Bar, while your buddy might prefer the small quiet local in the suburbs. Whatever it is you’re looking for, there’s something for everyone. Do a little research before you go though. Plenty of people have come up with lists that break down their top 10 pubs in Dublin. Read a few of them, and see which pubs on the list take your fancy. If you’ve got two good feet for walking, then you have all you need to get around the city. Dublin may be Ireland’s capital city, but that doesn’t mean it’s going to take you all day to walk from one end to the other. I love getting out on foot and exploring. You get to see so much more than you would if you’re in a car, coach or on a bus. But when those paws do start howling at you, keep in mind that Dublin has plenty of convenient options on wheels and rail – The Luas, DART, Dublin Bus and Dublin bikes are all good options, and there are always plenty of taxis around too. Of course I can’t take a guess at what you like to eat, and to be honest, I don’t really have a favorite Dublin restaurant of my own. However, Dublin is very cosmopolitan, so whether it’s Irish, Chinese, Mexican, Italian or some other type of food that you’re looking for, then Dublin city can certainly satisfy your desires. Take a look at menupages.ie to get an idea of what’s in store. You’ll find tons of good restaurants listed, and most come with customer reviews. If you have an iPhone or an Android phone you might want to stop by your app store and grab some travel apps for your trip. There are a few good ones out there. You’ll find apps for almost everything related to travel including ones for accommodation, things to see, hiking trails, navigation etc. Irish Fireside has a few suggestions for you here.